A cherry finish tabletop complements a rich bronze finish base in this traditional end table floor lamp design. This traditional end table floor lamp features elegant scrolling accents on the base. A bottom display shelf offers space for storage, helping to keep the cherry finish table top surface free of clutter. This handsome look is a great way to save on space in a living room, family room, or bedroom, and is perfect for farmhouse or country-cottage settings. Overall: 54" high. Table is 22" high x 14" wide x 20" deep. Shade is 6" across the top x 16" across the bottom x 11" on the slant. Weighs 15 lbs. From tabletop to bottom of shade is 21". Traditional end table with a built-in swing arm floor lamp. From the Regency Hill brand. Cherry finish wood top. Bronze finish metal legs and scrollwork. Bottom shelf for storage. Collapsible burlap fabric shade. Mainly I chose this because it had a table. In my den, to put magazines & other reading material on it. End table lamp combo, allows more available table surface. Swing arm when task lighting is needed. Great look for the end of my leather sectional. Needed a narrow floor lamp to fit between two twin beds..
Student decor - love the functionality of light, table space and storage. Perfect for my daughter! Table to put my tablet, phone, and etc. on. Lamp that will swing out for different tasks and the price is great. It will go in our lanai and I liked the bronze scroll work and the burlap shade. I needed a side table and a lamp this piece will be perfect. can't wait to receive it!!! Matches a high end table I had previously purchased at another location which no longer exists. I will use this floor lamp in a small bedroom for additional lighting and it exactly matches the bed. Building a cottage and this will fit in the small living room area. It is perfect for our log home.....I even have rubbed bronze iron crosses.. Integration of the lamp into the table saving space. Matches furniture in my guest bedroom. Right size for area. Table larger than most floor lamps. Rack will hold knitting! Needed additional lighting for my den. Hopefully this table will be good size that I want. Small size and swing arm for reading. Need something to go between recliners as we watch tv plus need light to read by. It is cherry wood and will match cabinets. Everyone said it is easy assembly. Hope so. It is the only one I could find for under $200.00 that is the right size. It should go perfectly in our living room. I liked the style, plus they are half price. It fits our decor and needs and priced right. This one is the perfect style, size and price I have been looking for, so I got two! what is the weight of the lamp & table combined? BEST ANSWER: Hi - the total weight for this design is 15 lbs. I just tried lifting it up. I weigh 103 pounds. The lamp/table did NOT seem heavy to me. I would guess the weight at about 7 pounds. Don't know exactly it's pretty light weight, easy to move about. Does the Travata End Table FLoor Lamp accommodate the LED equivalent of a 300 Watt incandescent light bulb? BEST ANSWER: The socket rating is 150 watts max. We currently do not offer an LED bulb that will fit that is equivalent to a 300 watt incandescent bulb. If you can find one, sure I do not see why not as long as you stay within the socket max rating. Small footprint made it a perfect addition to guest room without taking too much floor space. Shipping was super quick, but I never received a shipping confirmation with tracking information so I had no idea when it was coming. Packaging was solid. Delivery was very prompt. Came in just five days. Lamp was boxed securely, but wasn't too difficult to open. Great addition to our living room! This lamp table was very east to assemble and looks great. I love this table lamp. I wanted a table and reading light next to my reading chair. I have a big, rowdy cat, so I didn't want a table lamp. This fit my needs perfectly. I took a star off because I could not get the legs even and had to resort to put a small shim under one leg to keep it solid. Not optimal, but the table lamp is nice otherwise. The lamp table is not worth the trouble. For the price, my expectations were not high but it was intended for a hidden corner figured it would be ok. However, one of the top screws is installed in a way that a bump shows on the top and the fastener that goes in will not tighten with the allen wrench. In addition, the little stamped decorations are bent and are so thin that I would hesitate to move them too much for fear of having them break off. It also appears that the sides may be crooked but since I can't fasten them to the top, let alone connect other side pieces I can't be sure. Still waiting for a response from customer support. Right now it's a pile of rubble that is taking up space. The table was very easy to assemble and is perfect for the small space we had to place it in. It looks way more expensive than it is. These tables are as lovely as they are in the advertisement. They took about 10 min to assemble. I definitely recommend them. Needed a light for a small space at the end of the couch. This is perfect. It's well made and blends with most decor. Easy to assemble. Excellent Table Lamp. Ideal for reading between 2 chairs. Assembly was not difficult and the look is great. 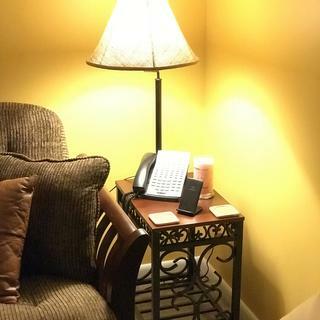 I am enjoying having a lamp alongside my recliner to enjoy reading. Great lamp for the price. This arrived in perfect shape and was easy to put together. I love the way it looks. I was curious how the lamp shade in the box. The shade is there but I don't want to ruin the surprise of how it fits into the box. I paid. We are very pleased. It is very, very nice and I like it. The lamp did not go together as it should have. I had to get a washer to attach the lamp to the table correctly, but it is fine now. 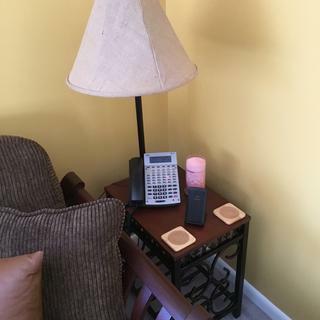 Nice table and lamp for the price I paid (HALF of what they are asking now). The shade, however, is too dark and is wrinkled. I replaced it with a white shade.